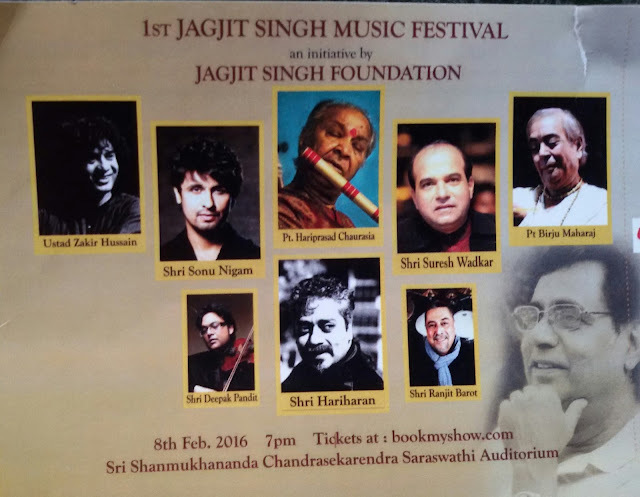 8th Feb 2016, the 75th Birth Anniversary of legendary Ghazal singer Padma Bhushan Late Shri Jagjit Singh, was celebrated in a spectacular legend-studded event: The 1st Jagjit Singh Music Festival an initiative by the Jagjit Singh Foundation along with sponsors Union Bank and Indian Oil at the wonderful venue of The Shanmukhananda Chandrasekarendra Saraswathi Auditorium in Mumbai. The amazing acoustics of this auditorium make it a favorite venue for all leading musical performances. I was fortunate to attend this grand musical feast despite last minute planning on a weekday, thanks to online booking! 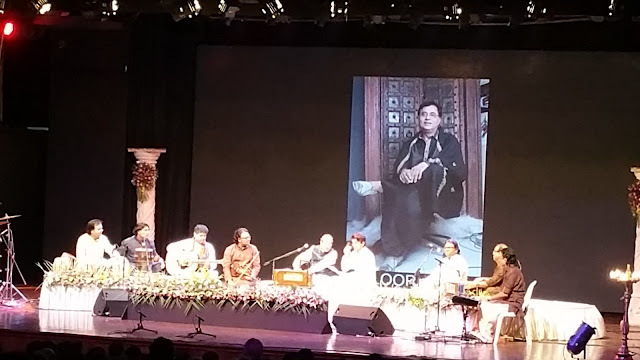 The auditorium, consisting of ground + 2 floors (total seating capacity of 2763) was packed to the brim with die-hard fans of the Ghazal legend as also by fans of the performing legends by 7 p.m, the designated time for the program commencement. The organizers cited crowd management problems and finally the much awaited event took off at 7.30 p.m, running well up to 11.30 p.m despite no intermission. The lighting of the hazard-free electric lamp was done by Smt Chitra Singh wife of the deceased Maestro, accompanied by dignitaries from the Jagjit Singh Foundation, the sponsors and philanthropist businessman Mr Harsh Goenka. The Master of Ceremonies presented the inaugural instrumental performers, notably the accomplished Violinist Mr Deepak Pandit who had worked with the ghazal maestro for over two decades, the suave and stylish Mr Ranjit Barot at the drums to the accompaniment of other percussionists, harmonium and keyboard artists for a scintillating performance in perfect harmony. 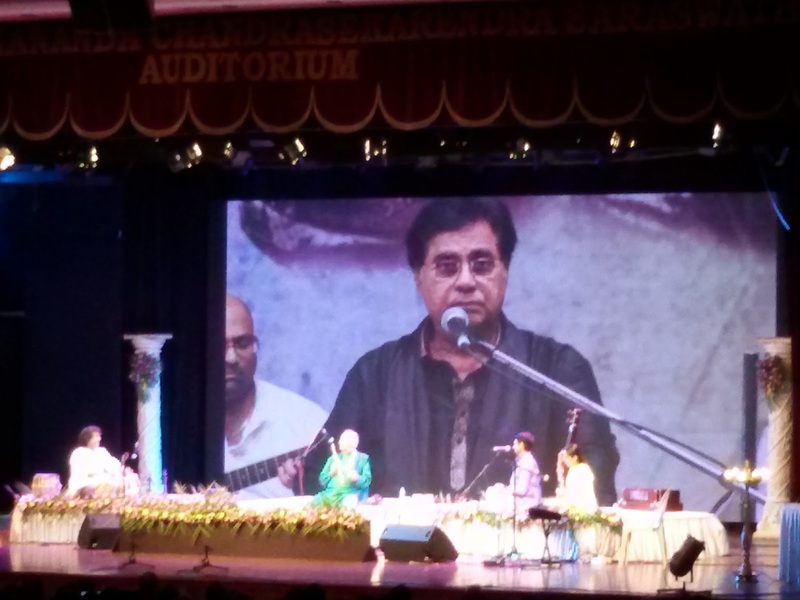 After this rousing start, the stage was taken over by the multi-lingually-talented Shri Hariharan, who sang a couple of ghazals from his album Kaash and also a couple of Jagjit Singh's ghazals. 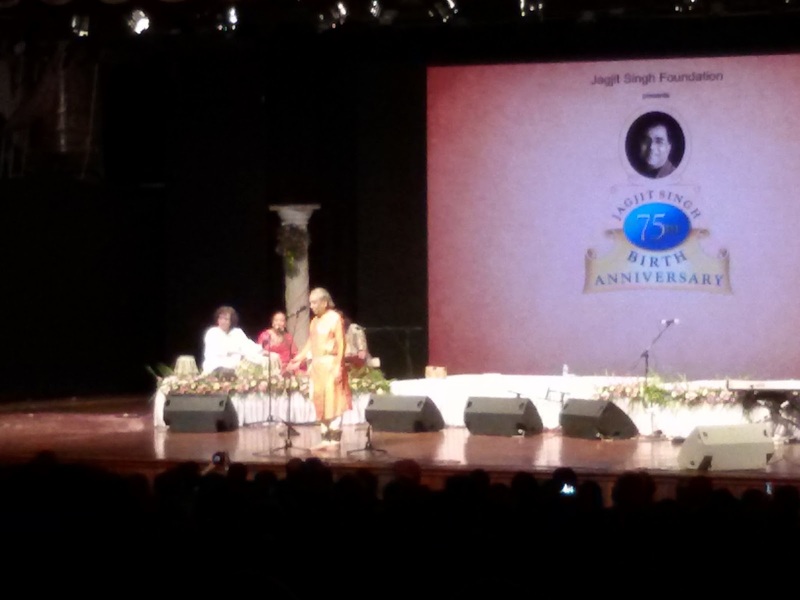 Next the stage welcomed the amiable veteran singer, Shri Suresh Wadkar who rendered a couple of Jagjit Singh's mellifluous ghazals in his rich velvety voice. After this the much awaited charishmatic, vibrant and exceptionally gifted singer Shri Sonu Nigam took over the stage, infusing it with his infectious enthusiasm, cheer and charm. It was rather touching and endearing to watch Sonu's reverence for his senior, Mr Wadkar whom he entreated to join in his soulful, renditions of the Maestro's super hits like Hey Ram, Ahista, Ahista, Mera Geet Amar kar do and a couple more. Sonu was joined on stage by Ranjit Barot with his eclectic performance on the drums, the flawlessly superb violinist Deepak Pandit, and an equally talented flutist. 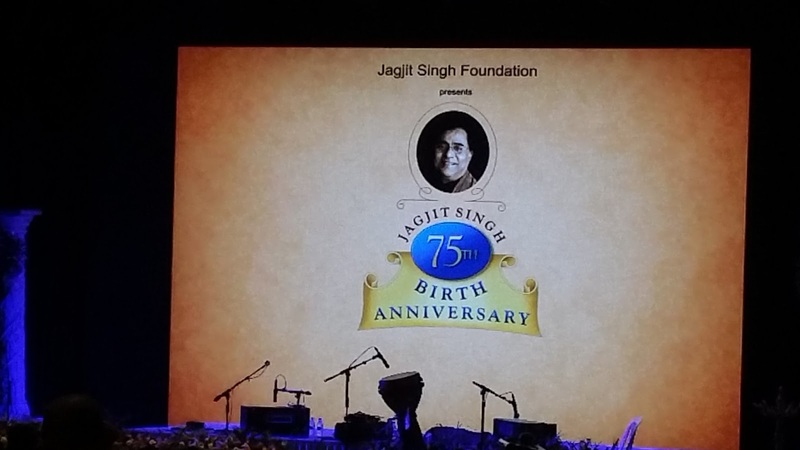 This was followed by the felicitation of the various performing legends by the foundation, and a thoughtful AV that captured the sincere emotions of various legends towards the beautiful human behind the inimitable voice - Jagjit Singh. The AV included many stalwarts from the Bollywood fraternity and music fraternity expressing their thoughts and memories of the Ghazal Legend. It also showed a clipping of the first Award for outstanding contribution to music from the Jagjit Singh Foundation to the brilliant Music Director Ilayaraja. The audience was mesmerized by the venerable Panditji's soul-stirring flute notes and the mind-zapping versatility of the Ustaad. The piece de resistance was the age-defying nimble and impeccable adas, abhinayas of the tukras by the kathak dancing legend Padma Vibhushan Pandit Shri Birju Maharaj performing to the beats of the tabla Ustaad. If this was not enough, as a grand finale to this wonderful evening commemorating the life of an incredible artist, was a confluence of all the great legends; Pandit Hariprasad Chaurasia, Pandit Birju Maharaj, Ustaad Zakir Hussain and Hariharan together on stage to create sensational magic with their immense talents! The audience could do nothing but watch with bathed breath and give a standing ovation to this legendary performance. Indeed it was a memorable and unforgettable evening, an evening to savor and cherish, when artists so divine performed together to produce a symphony so sublime. A celebration, an ode to the memory of that deeply resonant yet soothingly melodious ethereal voice that will remain eternally etched in our hearts and minds - Shri Jagjit Singhji.